Facebook wants to know if you’ve checked your privacy settings recently, as some users are seeing popups reminding them to do so. Hi Sreedev — Sorry to interrupt. You haven’t changed who can see your posts lately, so we just wanted to make sure you’re sharing this post with the right audience. (Your current setting is public, though you can change this whenever you post.) Learn more. The bottom of the popup contains buttons for friends, public, and more options. Every time you post on Facebook you can decide who sees what you share. 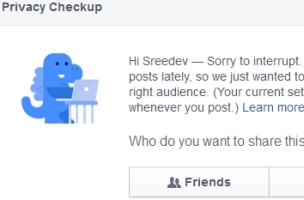 It looks like you haven’t changed who can see your posts in a while, so we’re just checking that your privacy is set the way you want. You’ll still able to change the audience any time you post something. If you’d like to learn more about setting privacy on your posts, visit the Help Center. Readers: Have you seen any of these Privacy Checkup messages?